The Duel After the Masquerade is a painting by the French artist Jean-Léon Gérôme, currently housed in the Musée Condé in Chantilly, France. The scene is set on a gray winter morning in the Bois de Boulogne, trees bare and snow covering the ground. A man dressed as a Pierrot has been mortally wounded in a duel and has collapsed into the arms of a Duc de Guise. A surgeon, dressed as a doge of Venice, tries to stop the flow of blood, while a Domino clutches his own head. The survivor of the duel, dressed as an American Indian, walks away with his second, Harlequin, leaving behind his weapon and some feathers of his headdress, towards his carriage, shown waiting in the background. 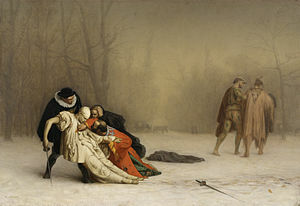 The bizarreness of the scene in regard to the brightly colored costumes turns to pathos at the sight of blood on the Pierrot. From Ingres to Gauguin: French Nineteenth Century Paintings Owned in Maryland. Baltimore Museum of Art, Baltimore. 1951. The Taste of Maryland: Art Collecting in Maryland 1800–1934. The Walters Art Gallery, Baltimore. 1984. Highlights from the Collection. The Walters Art Gallery, Baltimore. 1998–2001. Triumph of French Painting: Masterpieces from Ingres to Matisse. Baltimore Museum of Art, Baltimore; Philbrook Museum of Art, Tulsa; Norton Museum of Art, West Palm Beach; Royal Academy of Arts, London; Albright-Knox Art Gallery, Buffalo; Dayton Art Institute, Dayton. 2000–2002. A Magnificent Age: Masterpieces from the Walters Art Museum, Baltimore. The Nelson-Atkins Museum of Art, Kansas City; Mint Museum of Art, Charlotte; The Walters Art Museum, Baltimore. 2002–2004. Déjà Vu? Revealing Repetition in French Masterpieces. The Walters Art Museum, Baltimore; Phoenix Art Museum, Phoenix. 2007–2008. The Spectacular Art of Jean-Léon Gérôme. J. Paul Getty Museum, Los Angeles; Musee D'Orsay, Paris; Museo Thyssen-Bornemisza, Madrid. 2010–2011. From Rye to Raphael: The Walters Story. The Walters Art Museum, Baltimore. 2014–2016. ^ a b c Johnston, William R. (1999). William and Henry Walters: the Reticent Collectors. Baltimore, Md. [u.a. ]: Johns Hopkins Univ. Press. pp. 17, 183, 241. ISBN 0801860407. ^ "Musée Condé". Suite d'un bal masqué. Retrieved 8 November 2012. ^ a b Ackerman, Gerald M. (2008). Jean-Léon Gérôme: His Life, His Work (English ed.). Paris: ACR Editions. pp. 49–50. ISBN 2867701015. ^ "The Duel After the Masquerade". The Walters Art Museum. Retrieved 3 May 2017. ^ Mainardi, Patricia (Spring 2008). "Déjà Vu? Revealing Repetition in French Masterpieces". Reviews. Nineteenth-Century Art Worldwide. 7 (1). Retrieved 3 May 2017. ^ Weisberg, Gabriel P. (Autumn 2010). "The Spectacular Art of Jean-Léon Gérôme (1824–1904)". Reviews. Nineteenth-Century Art Worldwide. 9 (2). Retrieved 3 May 2017. This page was last edited on 12 July 2018, at 11:21 (UTC).